For pictures and score breakdown, please click on the link below. There we go....2013-2014 Science Olympiad Season is finally about to start.And we are so much ready to win. 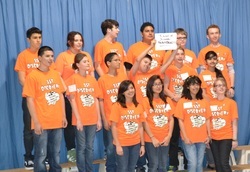 On this Saturday,December 14, 2013,fifteen students and numerous volunteers from SST-Discovery will be venturing 2 hours up to Austin to compete with top students from 23 other teams at the annual Austin Invitational Science Olympiad. This competition is a practice, also is a wonderful opportunity for our students to get familiar to the actual Olympiad. Tarleton State University Science Olympiad managers just announced the list of the events.Please click on the url below to see the list. It will be held on Saturday,February 1, to make up. You will be informed in advance. We just received our very own spirit shirts. Regional Science Olympiad date and location has been announced.